The very latest version 4.9 of WordPress, named “Tipton” in honor of American jazz musician and bandleader William Lee Tipton, has just been released and is now available for download or update in your dashboard area. Just like all previous WordPress updates, the second and probably the last major release of the year brings a plethora of revolutionary improvements, bug fixes, general updates, and of course some exciting new features to both users and developers. So, without further ado, let's dive in and take a closer hands-on look at all the goodies WordPress 4.9 has to offer! Publish: Publishes theme changes immediately. Save Draft: Saves your tweaks as a Draft and lets you publish whenever you want. Schedule: Schedules your theme changes to automatically go live at a specific time. 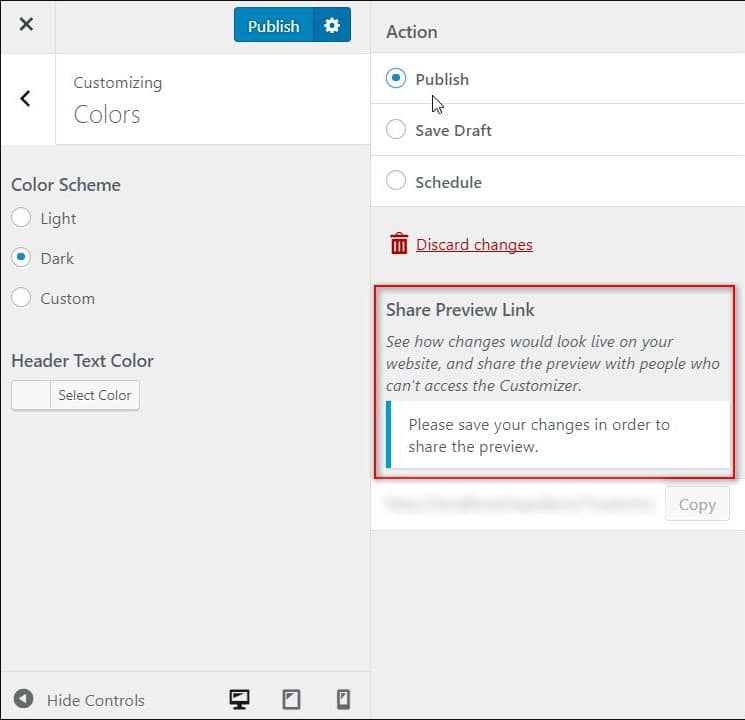 Apart from that, with the new Share Preview Link feature, now Customizer also allows you to share a preview of the proposed site design changes with your team members as well as with your visitors who don’t have access to the Customizer. This makes the collaboration extremely easy! Protect Your Changes with a Design Lock: Similar to post locking, design lock feature in WordPress 4.9 guards your theme changes so that no one can modify or delete all your hard work. This feature proves quite useful in situations where more than one designer is working on the same project. 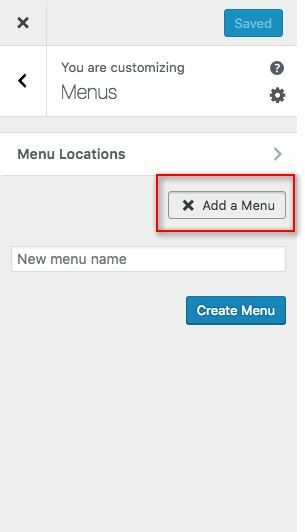 To solve this issue, WordPress 4.9 has broken the entire menu creation process into several small steps with clearer instructions, making it easier and smoother for users to create menus without any unnecessary button clicks. 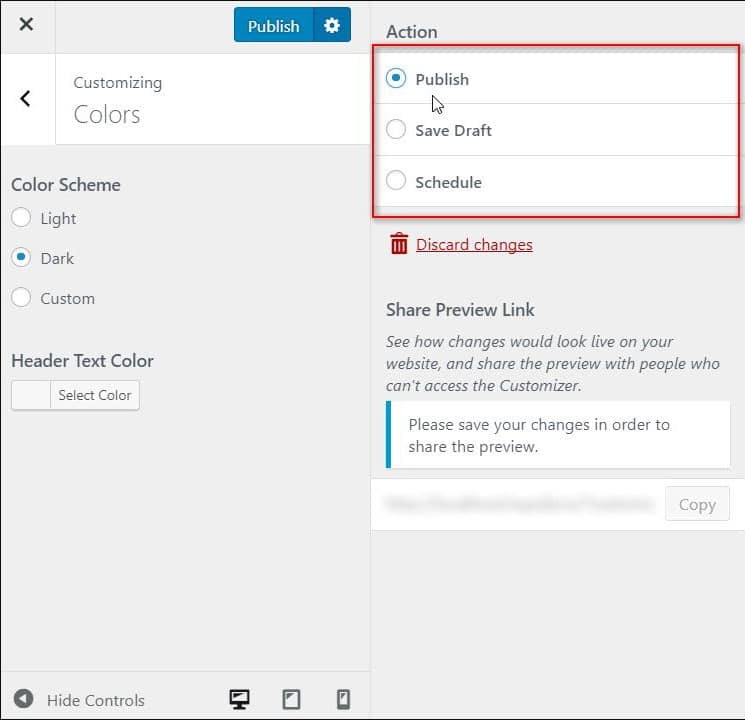 But in WordPress 4.9 Customizer, not only you can see all your installed themes but also you’ll be able to browse, preview and install themes directly from the WordPress.org theme directory. All you need to switch between ‘Installed themes’ and ‘WordPress.org themes’. 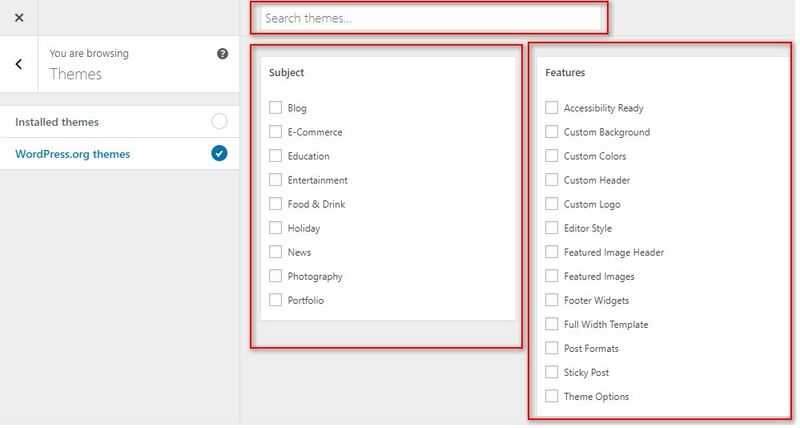 There is even an intuitive search box and a wide range of filters offered to narrow down your quest for the perfect theme. A Prompt to Protect Your Work: Do you often forget to save your new draft design or post while leaving your desk in a rush? Don’t worry! With the inclusion of ‘autosave revisions’ in the Customizer, WordPress 4.9 will now ask you whether or not you want to save your unsaved changes when you return to your desk. New Global Notification Area: Till version 4.8, WordPress doesn’t generate any success or failure messages about whether or not a save is committed. Instead, it just makes an indication by disabling the ‘Save & Publish’ button. 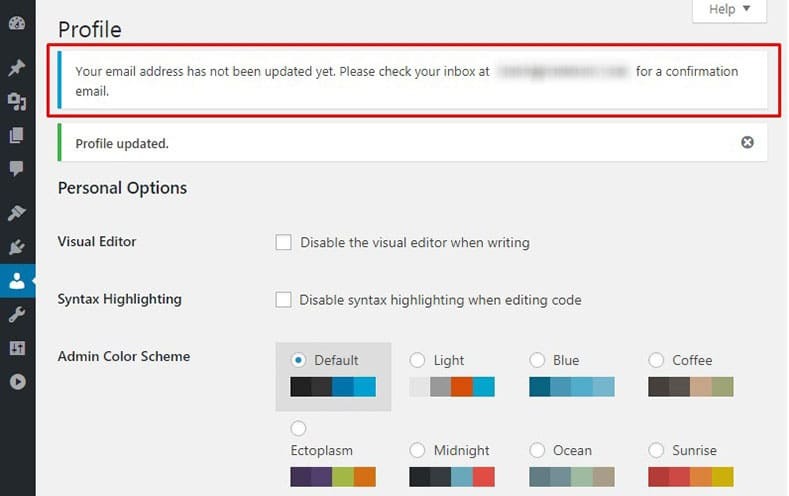 But, in WordPress 4.9, a new Global Notification Area has been added underneath the Publish button in the Customizer to display these success/error messages. 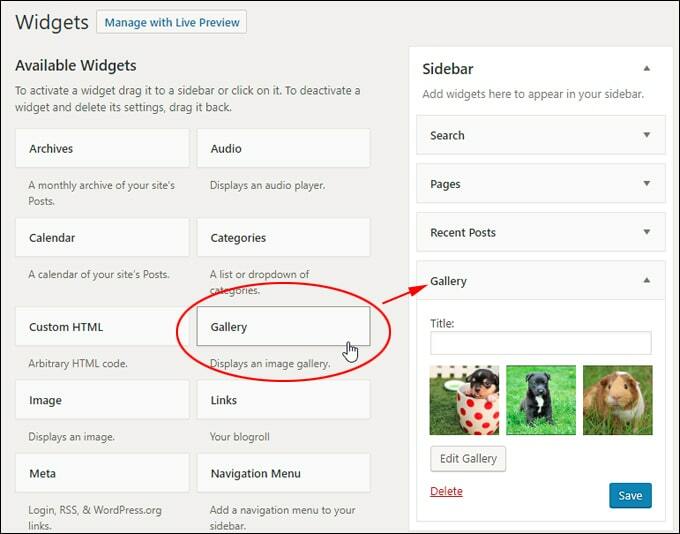 A Brand New Gallery Widget: In earlier versions of WordPress, you needed to use Jetpack or another third-party plug-in to add images to the sidebar of your website or blog. To address this issue, Version 4.9 comes packed with a brand new dedicated Gallery widget which allows you to create a native gallery and show it up in any widget ready area. 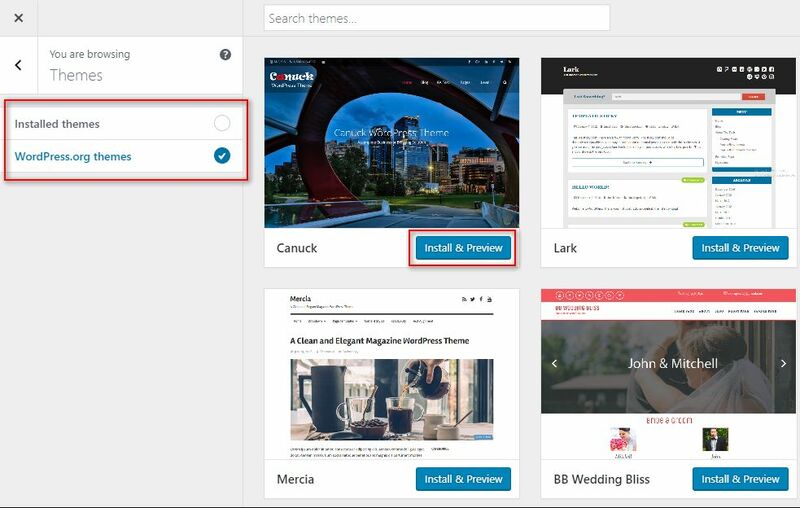 And what's more, leveraging the power of the core WordPress Gallery functionality, you can even change the number of columns, size and order of your images to be displayed in your created sidebar gallery. 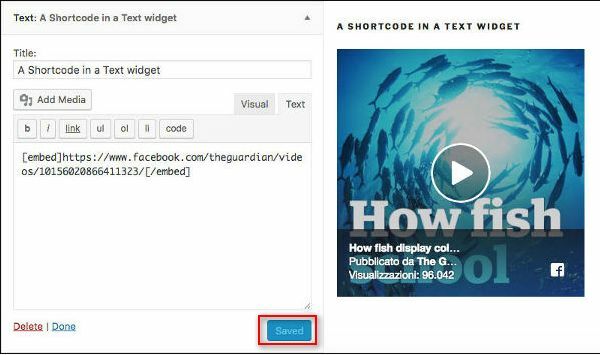 Improved Text Widget: Previously, you had to write the HTML code in order to add media files to the Text Widget. Wasn't that really a very time-consuming process? 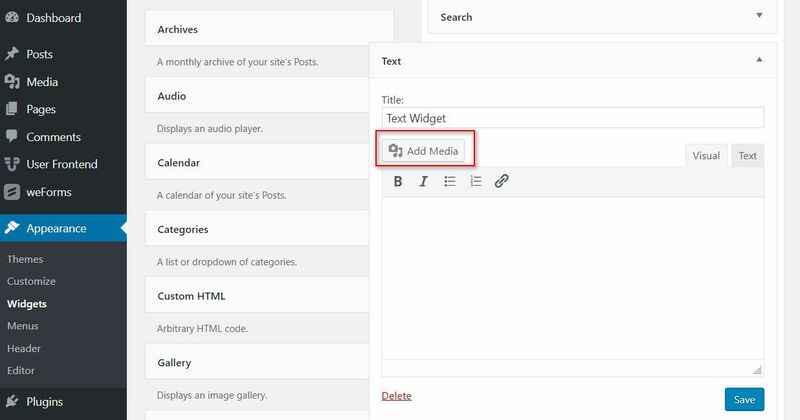 WordPress 4.9 fixes this by adding an intuitive ‘Add media’ button on the on top of the editor in the Text Widget, which allows users to directly embed images, video, and audio into the widget. 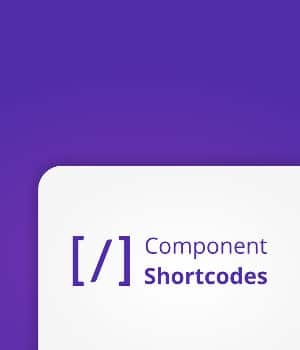 Additionally, the Text Widget now natively support shortcodes, eliminating the need of adding add_filter('widget_text', 'do_shortcode') or add_filter('widget_text', 'shortcode_unautop') to plug-ins and themes. Furthermore, there is a much better indication of saving the changes in widgets with the newly added Saved button. In WordPress 4.8, there was no such clear way to understand whether or not your changes are saved. 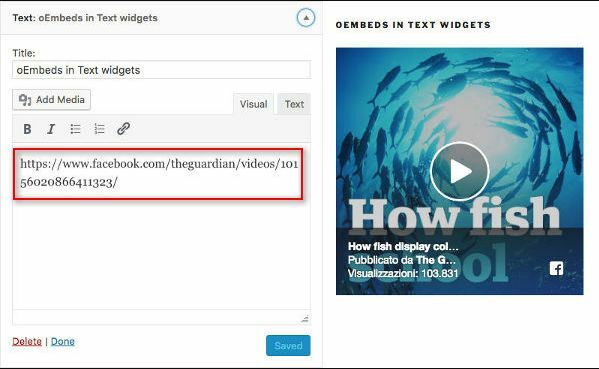 Expanded support for oEmbed: The Video Widget is currently limited to embedding videos from only two video platforms which are YouTube and Vimeo. 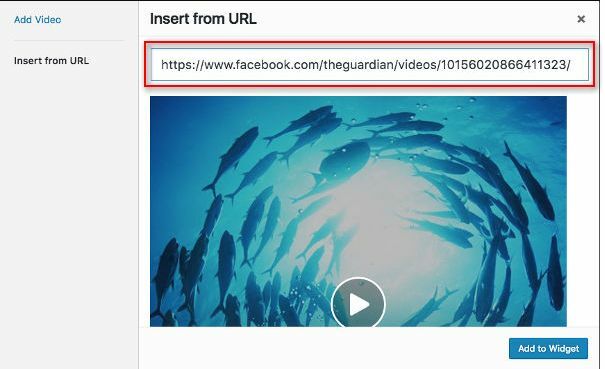 The list has now been expanded to make it possible for you to embed videos from any platform that support oEmbed, like TED, CollegeHumor, FunnyOrDie, Facebook, etc. 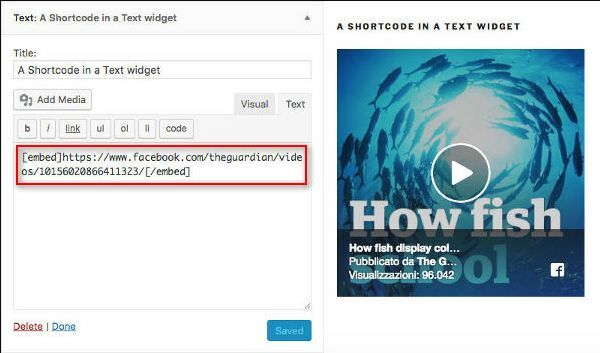 Even, oEmbeds now also work outside the post content, including Text widgets. Is this really not a big deal? Improved Widget Mapping: In earlier versions of WordPress, there were very high chances of disappearing or relocating widgets after you switch themes. On the other hand, Version 4.9 provides you a more persistent menu and widget placement when you change your website’s theme. An improved widget mapping helps widgets find their real home even after a major change, offering you a more reliable theme switching experience than ever. Starting in WordPress 4.9, the CodeMirror will enhance your coding experience in the theme editor, plug-in editor, and the Customizer. 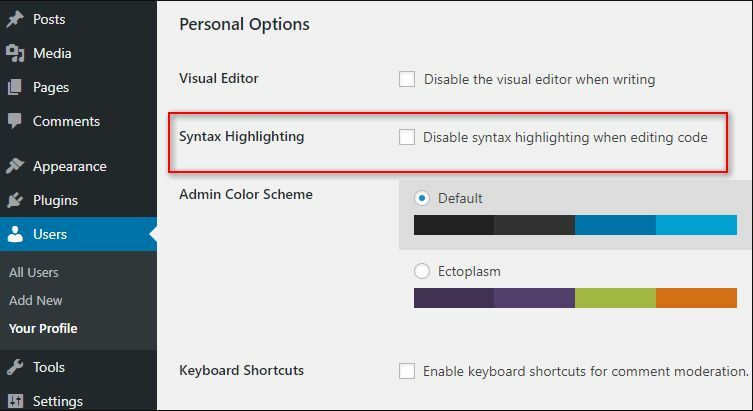 And if you don’t like the new syntax highlighting feature, you’re always free to turn it off from your user profile page. 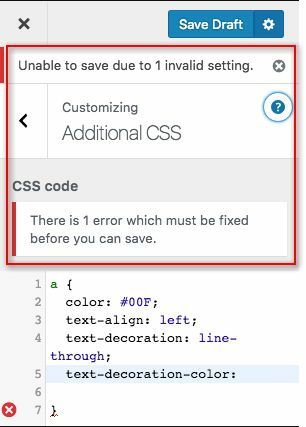 Another minor improvement made to the editor is a pop-up warning message which comes into view when you try to directly edit any code in your theme or plug-in. 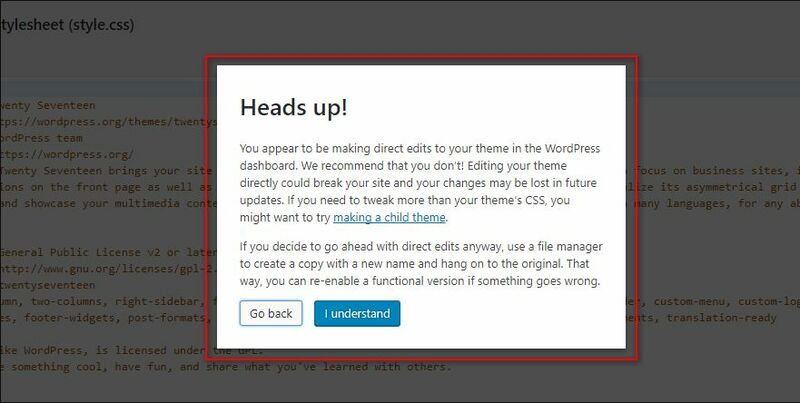 WordPress 4.9 now warns you why it is a dangerous practice and how you can edit your files the right way. Additionally, as already mentioned above, version 4.9 now also warns you about saving a corrupted code when working on themes and plug-ins so you can sleep better at night. Unless you confirm by clicking the ‘I understand’ button, you won’t be able to make any changes to your files! The WordPress Core Team has made several improvements to the Customizer JS API, making it as easy to work with as the PHP API. These changes also allow for better controls, beautiful outer panels, and enhanced on-screen notifications. 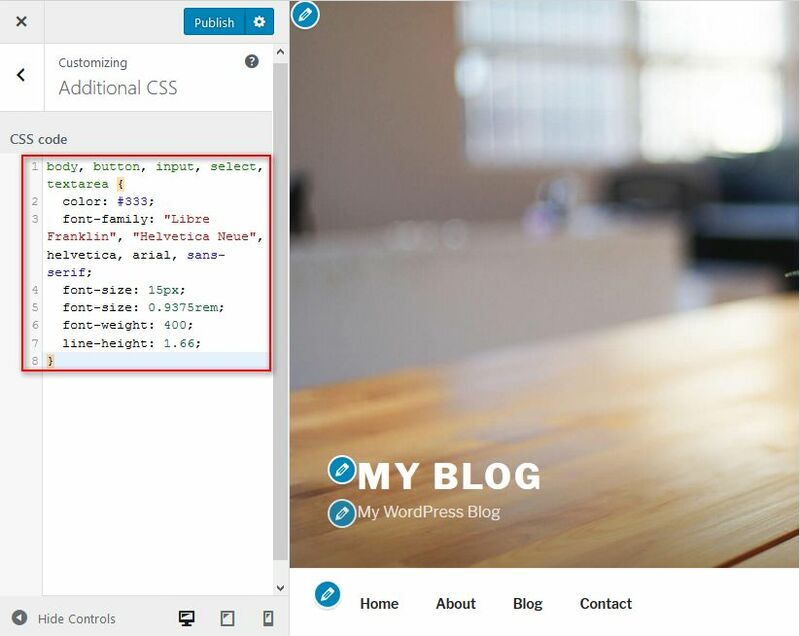 The MediaElementJS framework has been upgraded to v4.2.6, which removes all jQuery dependencies from the WordPress core, enhances accessibility and gives a new modern look to the UI. In fact, this is the change that makes it possible for the Video Widget to support all oEmbed providers. Plug-in icon now shows up next to the plug-in when you go to run updates. So this was all about WordPress 4.9, which is now available to end-users. 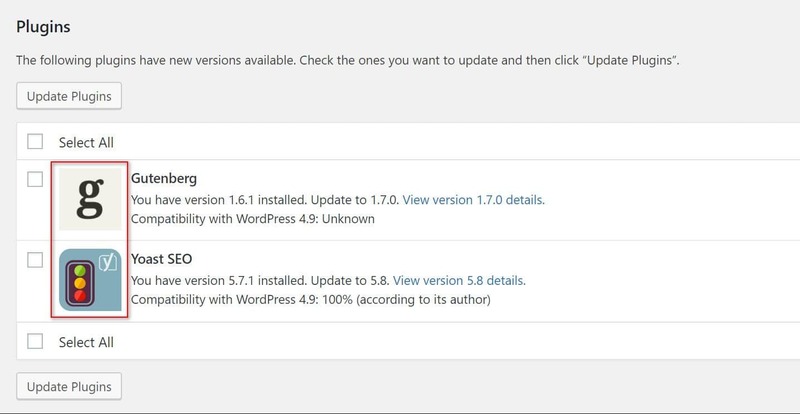 If you’re interested in testing out the new version, you can either update WordPress in your Dashboard or download the latest version from here to play with it locally on your computer – the choice is completely yours! What to Do Before Updating WordPress? The second line of my tool bar in pages has gone missing. I cant change the colour of text to press undo. where has is gone with this update? Genuinely awesome post, it doesn’t mean for fledglings, however experts as well. 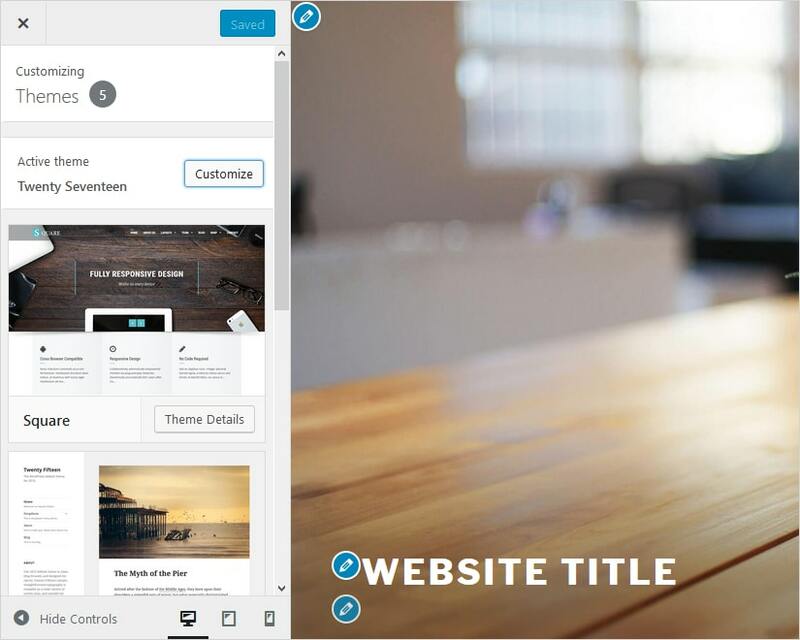 Wordpress 4.9 have many more great features which your article is showcased about.What’s more, WordPress 4.9 comes convenient with regards to learn new aptitudes.. 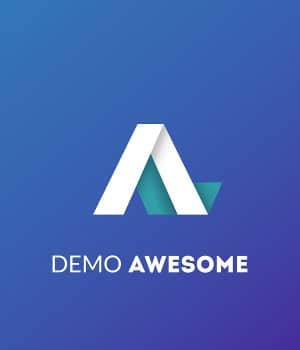 I can’t find a showcase that shows sites with the theme Evolve just testimonials. Yet it shows the different styles that one can have.